A garlic scape is the elongated, curly stem that emerges from the central stem of hardneck garlic plants in early summer. It’s actually the precursor of the garlic’s seed head or flower. The scapes are delicious, and removing them will ultimately result in a larger bulb of garlic. This is best done when the scape has about one full loop in it. If you wait too long, they will straighten out and become tough and stringy. Even if they straighten out, cut them off to encourage larger heads of garlic. 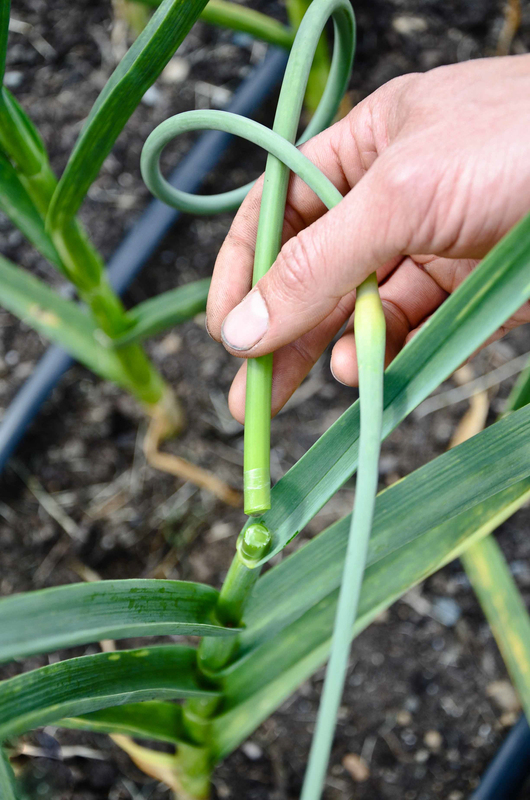 To harvest: In the early summer, once the scapes emerge and curl, break them off immediately at the top leaf of the plant. Young, tender garlic scapes can be enjoyed raw or cooked. Their mild, bright garlic flavor makes them extremely versatile in the kitchen. They make a delicious addition to salads, can be sauteed and used in pasta dishes and are even great pickled! Our favorite way to enjoy garlic scapes is to blend them into a pesto.